Kenmore is a Sears brand under which a variety of home appliances are sold, including a wide range of laundry washing machines. The Kenmore 80-series product line, released throughout the early 2000s, had washing features that were advanced for its time. However, even the best washer can malfunction. Learn how to troubleshoot and resolve common washing machine repair problems with this Kenmore series. As a result you'll get the clean, fresh laundry that you and your family want. Learn basic washing machine repair and save yourself money. Check that the Kenmore washer is plugged into a reliable, direct power source and not an extension outlet or cable. Washing machines require a large volume of power to run. 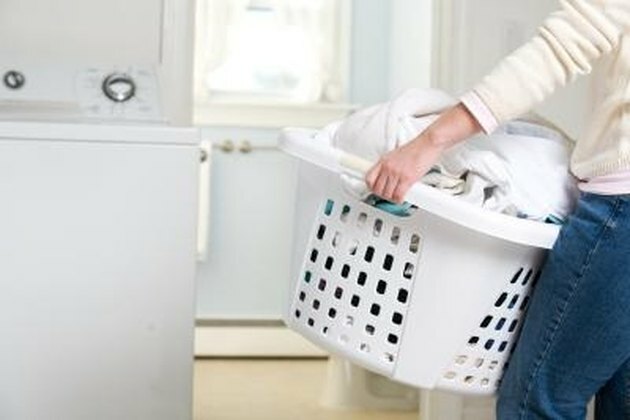 In addition, check that your laundry room's circuits were not tripped, which may happen after a storm or power outage. This may resolve issues regarding a washer not starting up. Make sure the laundry inside the Kenmore washer is evenly distributed throughout the washing drum and that you have not stuffed too much clothing into the washer. This may resolve issues such as unreliable cleaning results or washers that won't spin or stop halfway through a spin cycle. Verify that the cold and hot water valves that connect to the washer are turned on completely. This may fix problems such as incomplete rinse cycles or running colors caused by improper water temperatures. Most valves have a knob that can be turned manually to physically open or shut down the water flow. Inspect the Kenmore washer's drain pipe and tubing. Clear the tube of any blockage such as lint, debris or ice during cold winter months. This may help when the washer doesn't drain completely or overflows. Use a broomstick or similar object to check the middle of the drain tube for blockage that may not be evident at the end of the tube. Make sure you do not pour too much powder or liquid laundry detergent into the drum of the washer. This is one of the most common causes of water overflowing out of the washer, which can be a costly and inconvenient mistake. Follow the detergent manufacturer's specifications on the appropriate amount of detergent to use.